We had an incredible turnout at Occidental Brewing this afternoon – 20 players! That is, in fact, a new record. There were a lot of newcomers or people returning after a long absence as well – I think 7 or 8 people I had not had the pleasure of meeting before. We caught the management off guard – I should have scoped out the location earlier and I would have learned that they were a little on the smaller size, in the area we took over. Probably should have given them a head’s up, but Sara and others smoothed some feathers with the staff and once we got running, it went very smoothly. If we go there again, we’ll warn them, and probably move to the upstairs space, which is (I’m told) a little larger (I never made it up there today). Martin assured me that this is the best brewery in Portland, even though it is somewhat out of the way for people, based on the majority of comments I got. Being such a large group, I divided us up into two brackets. You would think 20/2 = 10, but with the chaos of filling in the brackets as a few stragglers rolled in, we ended up with 9 in the A bracket and 11 in the B bracket. Oh well! The “A” bracket ended up in a newcomers show-down. Karen beat out William for 1st, and Billy won the consolation bracket. The “B” bracket went to the established crew, with Nick beating out Gints for the big prize. I squeaked out a win in the consolation bracket, mainly because Mark F left “early” – I would have had to face him again, but he didn’t want to stick around another half hour or so for the $10 entry refund that went to third place. So: payday! Greg made the suggestion that the consolation bracket should run 3 point matches instead of 5 point matches, in order to wrap up a little faster. By definition the consolation bracket starts later, and so it was running long. Thanks for the suggestion, Greg, we will definitely do that next time! The other big thank you goes to my daughter, Kira, who took over the clipboard while I played and helped keep the tournaments running smoothly. What a great Father’s Day gift, eh? All in all, we did manage to finish the tournament by 6, although Nick and Bryan were observed playing a money game as I headed out. Some people never get enough, I suppose. If you want more, we’ll do it again next month at Great Notion, on July 16th. I’ll call and warn them first! We had a record turnout for the Chouette this month – 9 people! I was hoping we would break into double digits, but maybe next month. Mark F, fresh off his second place finish in the Chicago Open Master’s, was feeling peppy going in, and he was in charge of the “advanced” board. He asked me not to mention how he did, you can draw your own conclusions there. Julie took over the “beginner” board, where she held the box for a long, long time against newcomers Tanya and Ted. They had a lively time with lots of discussion about the best moves at each point. That left Gints and I on the “middle” board, which, if you count carefully, does not equal a chouette. But we had fun anyway. Here I’m red, Gints is white, I have two on the bar and am being redoubled. Would you have offered that double? Would you take in my place? The race is actually pretty even, he’s up 132 to 143. My risk is, nothing is especially holding him back at this point. He has 4 and 6 to hit my blot in the outfield, worst case scenario is bring the back checker around. Seems like a pass to me, and it is. In fact, it is too good to redouble! Winning chance is at 76%, but 44% is gammons. GnuBG says no double has equity +1.117, XG says +1.141. I’m about to get buried here, and I took the chance to drop. If you don’t think about the gammon chances, it seems like a close call, but the majority of the losses are gammons, and since the cube has already been turned, they count. Anyway, a good time all around – we’ll do it again next month! Chouettes will be on the second Saturday of each month through August – so June 10th, July 8th, and August 12th. They will all be at Lucky Labs on Hawthorne – that’s 915 SE Hawthorne Blvd if you want the actual address. Turnout has been pretty consistent so far, I hope we will build it up to be able to consistently have two tables going by the fall. Play starts at 1:00 and goes until 5:00 or so, depending on when people fall out. We will have the June tournament on the 18th at Occidental Brewing, 6635 North Baltimore Avenue, starting at 1:00. Format to be determined – I’m thinking we’ll probably go back to a single double elimination bracket unless the turnout is pushing 16. Last time around, we moved it up to 5 point matches, and no-one complained, so we will likely do that again. For July, the tournament will be on the 16th at Great Notion, 2204 NE Alberta St #101, again starting at 1:00. Same caveats as for June. Have you noticed a theme of North Portland based venues? I figure we will keep moving each month until someplace just screams to be the new “permanent” home. We had a great turnout for today’s Chouette – 9 people total. Mark F kept order on the “Advanced” board, where 5 brave souls played for $10/point; while I (mostly) played with 3 others on the “Beginner’s” board at $0.50/point. I say “mostly”, because I did get in about 4 games on the “Advanced” board, both before and after the “Beginner’s” board ran. Martin, Mark S, and Bryan were all still going when I left at 6:30, too! The action was hot on the “Advanced” board, of course, with Martin coming out well ahead but decent showings for a few others as well. Martin and Bryan are both off to Vegas later this week for the US Open, and so we all wish them good luck. The “Beginner’s” board was far more relaxed – couple of times people took a double that was probably a technical pass in an attempt to get the box. I had a good run as the box at the outset, which left me well up through the later rotation. Michael provided the board for the first bit, then we switched to Julie’s board when he needed to head out. Paul made his return appearance and I can assure you he hasn’t gotten rusty while he was traveling – he walked away with $0.50 in winnings! Here’s one position we ended up arguing about for a good little while. At the “Beginner’s” table, we had full consultation at all times, including occasionally the box helping the field or vice versa… Anyway, the argument was, do you come out or do you stay on the opponent’s 4 point? Julie was the captain, and wanted to come out past the bar. Paul and I were not so sure, and thought staying in provided more chance of a hit. Julie went with the escape, and good thing – staying back is a blunder! Black is not in good shape, but has 31% winning chance if he comes out, only 16% chance if he stays back. Later, in the following position, I offered Julie the cube. Good move? Would you take? I figured that I needed 5’s to get out, there’s a decent chance that won’t happen, and so this looks like a double/take. Julie disagreed, and dropped. Well, I was off! My winning chances are about 73% according to GnuBG, but my gammon chances are 41%, making this position too good to double! I clearly need to work on my probability estimates. Then again, with the Jacoby rule, it’s a proper double but still a drop. Lucky me, I wasn’t on the receiving side of that cube decision. We’ll be back at Lucky Lab for a chouette next month, probably earlier in the month, as the second Sunday tournament will be moving to the third Sunday to not conflict with Mother’s Day, and then following that is Memorial Day. So yeah, the schedule will shift a bit. See you then! We got a couple of good suggestions for a new location, so I will go on a pub crawl over the next weeks and pick one. If it doesn’t work out, I’m not afraid to move it again! We experimented with a new format too. The fun thing about experiments is that sometimes they don’t work. It was far from a disaster, but it could have gone better. With 13 people, we had not quite enough people for two 8-person brackets, and so naturally I tried to run three brackets! That was also a function of trying to have both a $5 and a $10 entry. Then the side pool question got confusing for people… Well. By 3:10, I had 7 people signed up for the $10 bracket, so I got that kicked off. 3 people opted for the $5 bracket. Then newcomer George arrived. I wanted to put him in the $5 bracket, as a newcomer, but he insisted that he wanted to play the $10. So that filled the $10. 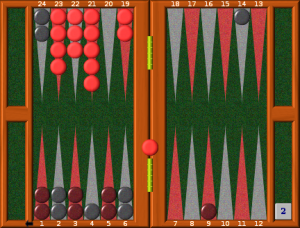 Turns out, George is a professional poker player and no slouch at backgammon – more on that in a bit. Mark F and Bryan both arrived before 3:30, and I promised them a second $10 bracket. Here’s where my planning fell apart. A few months back, when I visited the weekly tournament in Vegas, they run it on a strict 8 person bracket, once you’re out you have to buy-in to a new bracket. I was thinking people would do the same, but I wasn’t considering that I was using a double-elimination structure still, which meant that no-one was finishing up to enter the third bracket. So Mark & Bryan ended up just playing heads-up. Sorry guys! In the $5 bracket, Julie trounced newcomers Bob and Aaron, although knowing Julie, she was very nice about it. In the $10 bracket, Kevin repeated his undefeated approach from last month. Now let me whine for a moment. 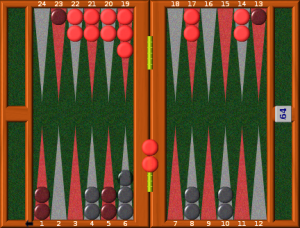 My first game was against Sharon, and it was a good match – lots of ups, lots of downs. I barely squeaked by, then sat down to play Larry. It was a good match again: I won, he won a double, I got through the Crawford game, and then was cruising towards a crushing victory in the double-match game. I had him trapped behind my prime, his board was crashed, put him on the bar, started bearing off – clearly victory was mine. Until I was forced to leave a blot, and Larry hit it. 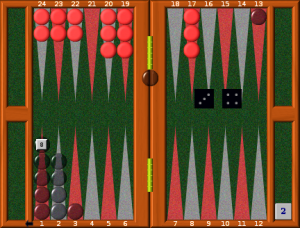 Well, that happens, and I had a huge edge, came in immediately, just needed to get around the board and… Larry rolled double 6’s. So now he was bearing off while I was still getting around the board, but no big deal, I had some big rolls, and soon enough we were sitting with me having 5 checkers to bear off and him having 12. 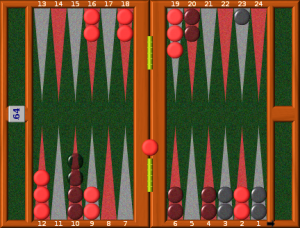 Now, he was on roll, but no big deal, the only way he could win was to roll doubles – 3 times in a row. Which he proceeded to do. 1 in 216 odds, I lost the match! Well, I went down to the consolation bracket to play George, who told me he plays mainly on Gridgammon, and has spent a decent amount of time playing Victor Ashkenazi. Playing online against giants does tend to hone your skills, and so George took me out too, though I think I gave him a decent run for it. George ended up winning the consolation bracket, which got him his entry fee back, but not his side pool bet. I had declared that the winner of the side pool got it all, and that ended up being Larry. Talk about a lucky guy! Larry placed second, losing to Kevin in the final, but Kevin had not entered the side pool! So Kevin got the winnings for the tournament, but Larry got about twice that for the second place plus the side pool! Again, a learning experience for me. With the shorter tournament structure, I think next time we’ll do 8 person, single elimination brackets, and if you want to keep going you can buy into a new bracket – Vegas style. So next month, aside from the venue and the format, it’ll be about the same. Also, in response to Tim’s lobbying, the tournament will start earlier in the day – noon or 1, I think. But other than that, about the same. See you there! There wasn’t any snow or ice to keep us from the bar today! We had 11 people play in the tournament, a pretty decent turnout. An extra special thanks goes out to Demi, who was planning to just hang around while Bryan played, but who let me twist her arm into playing when it turned out that I had filled out the 11 person bracket with only 10 players. I am actually pending final results, because with such a large pool, play ran a little long – so I left the #1/#2 players to duke it out without me. 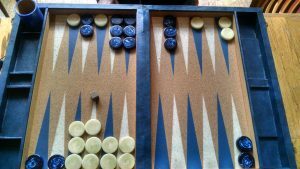 My best story of the tournament is newcomer Trish, who found out about the existence of the backgammon meetup group only last Wednesday – when I ran into her completely at random with a board on the table in front of her. 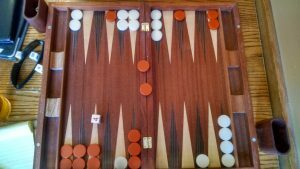 Backgammon is out there more than you’d think – if you run into someone with a board, tell them about the group! We’re always wanting more players. There was a good number of side games and conversation going the whole time through, I believe it was about the liveliest meetup in a year. Old-timer Reid was the walk-on beast to beat, although we tried to liquor him up enough to give the rest of us a chance. But the other one to watch was new-comer Tim, whose wife Emily also played. They must have some pretty fierce competitions going at home because they were both forces to be reckoned with. Tim won a couple of games, then dropped to the consolation bracket, only to fight his way back up to the final match. 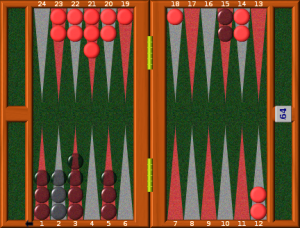 As a result, he definitely won for getting the most backgammon for his money, playing a total of 6 matches! By 6:30, it was down to these two to duke it out. I had promised to be home by 6:30, and so had to bail at that point. A good half-dozen people were still hanging around to share stories and watch the final battle. I will update this post once one of them tells me who won, to indicate the final rankings of everyone. Thanks again to everyone for the great turnout, and hope to see some of you next week for the Chouette! Well… there wasn’t a tournament. The weather made travel problematic for most people. Didn’t stop a couple of us showing up, though. Jarom and I played a money game for about an hour and then hung it up – one dollar changed hands, but only because we didn’t start keeping track until after the first game. But we’ll be back next month!